Our classic medley basket has plenty of scrumptious treats to celebrate any special occasion. 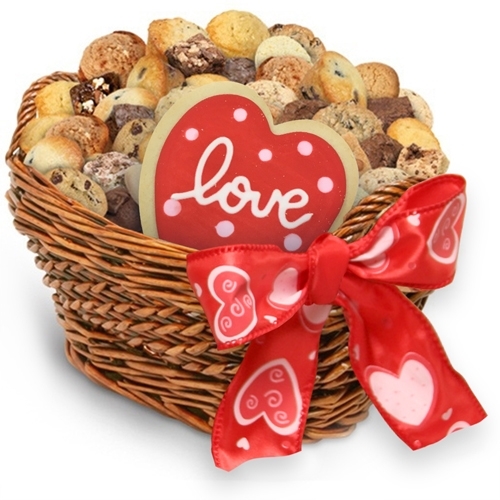 We've filled this basket to the brim with eighteen delicious assorted mini cookies, twelve decadently rich assorted mini brownies and twenty four delectable assorted mini muffins, as well as a 4 inch decorated heart shaped, frosted butter cookie. This tasty basket offers irresistibly delicious treats for that special someone for this special day. Of course, all goodies are individually wrapped servings for the ultimate in freshness. This gift includes a free gift card.